Elegantly restored palazzo in town centre, with *Michelin restaurant. Arrive in Norcia, historic walled town, birthplace of St Benedict and renowned for its much cherished gastronomic speciality – the truffle. Free day around Norcia: Travel by road to picturesque Castelluccio (4,000 ft) and walk across the Piano Grande, the most inspiring highland plain in Europe, then back down to Norcia. (9.7 miles, 5 hours). Alternatively explore Norcia, its central piazza with church of St Benedict (480–543 AD) and medieval town walls. Basic rooms in pilgrim hotel. Norcia to Roccaporena: Follow farm tracks across low hills to the small town of Cascia and churches with 14th century frescoes. Then follow an ancient pilgrim path along the gorge to Roccaporena, birthplace of St Rita, patron saint of desperate causes (12.9 miles, 6.5 hours). Beside medieval village and river, with renowned restaurant. Residenza d'Epoca: Beautifully restored Romanesque abbey. The church houses 12C frescoes restored by the ATG Trust. Roccaporena to Scheggino: Cross hills with oak woods famous for their truffles to Gavelli, with fine frescoes restored by the ATG Trust. Follow an old (dirt) road steeply down to Scheggino. 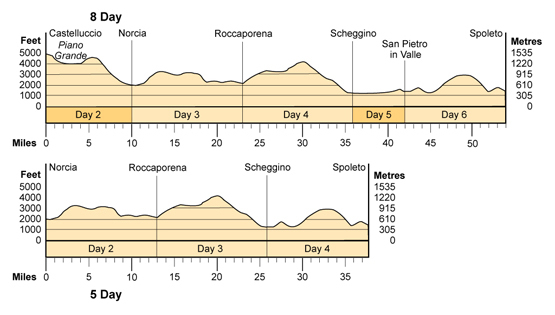 If staying at San Pietro in Valle, the Route Manager can arrange a taxi (10 mins) (12.9 miles, 6.5 hours). Roccaporena to Scheggino: Cross hills with oak woods famous for their truffles to Gavelli, with fine frescoes restored by the ATG Trust. Follow an old (dirt) road steeply down to Scheggino (12.9 miles, 6.5 hours). Valley Walk: Optional walk along the Valnerina Valley to the superb monastery of San Pietro in Valle, founded in the 5th century, with frescoes, Roman decorative fragments and sarcophagi of 8th century Lombard dukes (6.1 miles, 2.5 hrs one way). The walk is done in reverse if you are on the superior route. Friendly, comfortable hotel in quiet medieval quarter. Residenza d’Epoca: Elegant hotel with wonderful views. Scheggino to Spoleto: Follow the route of a disused, but once famous railway – a remarkable example of 19th century engineering. Descend through chestnut woods and olive groves to enter Spoleto across the Ponte delle Torri, the most elegant approach on foot to any city in Europe (9.1 or 12.3 miles, 4.5 or 6 hours). Free day in Spoleto: Explore the medieval city, its 12th century cathedral with frescoes by Fra Filippo Lippi, and important Romanesque churches. The Spoleto festival takes place during the first two weeks of July. Departure day... or continue with a further 8 days (48.6 miles) of walking from Spoleto to Assisi – see Umbria & Assisi. If you would like an extension booking at either end of your trip please indicate this during the booking process and we will contact you with pricing information. Woodland, sheep and mule tracks, dirt roads and ways over high open grassland with wide views. In the Monti Sibillini the route includes grassy ridges and well-made tracks on most ascents and descents. Some steep, stony paths. Sticks/poles strongly recommended. The fitness level of this trip is Grade 3-4. The walking is fairly demanding due to the ascents and descents, and occasional stony paths. You are rewarded with an extremely varied walk, with spectacular scenery. Truffle country! Noted for the superb Tuber Melanosporum of Norcia and Norcineria (the superb hams and salami of Norcia that have given their name to a generative term for cured meats used throughout Italy). Fresh trout from streams, game, lamb, sheep’s cheese and noted green lentils. Si mangia bene! Famous wines from nearby Montefalco and Orvieto, and some interesting ones from the Adriatic coast. What if I don't want to walk? How do I get to the start of the route? Where can I leave my car if I drive to the route? Do the hotels have WIFI, hair dryers, laundry service? I was very impressed by the standard and choice of half-board meals. This is the third time we have walked this route - and it gets better each time. This trip was the highlight of our time in Italy. You are doing a great job! Thanks to everyone at ATG for another excellent holiday. My husband and I have enjoyed many ATG walking trips. We have found the company to be helpful and professional as well as all route managers - we thank you all for some wonderful adventures. When you make the walk from Norcia to Castelluccio : the phrase says when you travel by road, are you riding in a car or walking? It’s a 3,000 ft climb. is it a busy road? quite hot in the plains: leaving early for the walks is a good idea as some of the steep ascents are quite exposed. 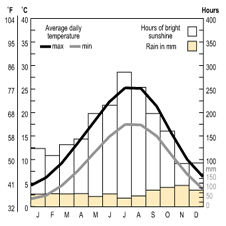 July-August is hotter, but as you are often walking high or through woods the heat is tempered. In summer the towns are lively and the evenings are long and balmy. In the summer, it is best to leave very early in the morning for the exposed, steep ascents. September is mild - it can be quite hot at the beginning of the month but cooling in the mountains. September and October are great for the autumn colours, the mushrooms, the truffles and as it gets colder the views become more dramatic. October can be wetter but when it is not, the quality of light is quite superb and the views are clear, sharp and breath-taking. NB. this is a mountainous region and all types of weather are possible so come well-prepared. direction, up and over several large hills (small mountains ranges, in fact), and down into wooded river valleys, and finally you reach Spoleto in the open Umbra valley (approximately 50 km to the south of Assisi). The paths are clearly marked and easy to follow: they vary from grassy tracks, woodland paths, mule tracks along river valleys, and open scrub land to some fairly rocky tracks (ascents and descents) and the occasional asphalt road. There is a potentially vertiginous section on the path between Cascia and Roccaporena, which skirts high above the river valley, with a steep hillside or cliff rising to your left. The path is in places quite narrow, with a steeply-sloping, wooded drop down to the water to your right. The path is however protected by railings in the more exposed sections. If you suffer severely from vertigo and would prefer to avoid the path altogether it is possible to walk the whole section along a road. You don’t have to! You can get a lift with the Route Manager to the next hotel when your bags are moved on, or we can arrange taxis and advise you of local transport options to facilitate shortening the walks. You are advised to organise your onward travel arrangements before arriving in Italy as there are not many connections between Spoleto and Norcia. The most inexpensive and convenient route is the direct bus from Rome to Norcia. See below for details of this and other options. From Fiumicino airport: The easiest (and cheapest) way to get to Roma Termini station is to take the direct Leonardo Express train, which leaves from the train station in the airport. After you've picked up your luggage, follow the signs to Stazione FS/Railway Station. You can buy tickets from the FS ticket counter or from one of the machines in the station. Tickets to Termini cost €14, trains leave every 30 minutes, journey time 30 minutes. IMPORTANT NOTE: Please remember to validate any train ticket you purchase in Italy before you board the train by stamping it in the yellow machine at the entrance to the platform; your ticket is not valid for travel unless you do this and you can be fined if you fail to do so. From Ciampino airport: There are shuttle buses to Roma Termini operated by Terravision (www.terravision.eu) and SIT (www.sitbusshuttle.com). If you buy your ticket on line it will cost €8 return, slightly more if you buy on the bus or at the airport/ station. Buses leave regularly from outside the departures terminal, journey time 40 minutes. Note: There is not a ticket counter selling bus tickets at Ciampino airport. You should simply go outside the terminal and look for the buses/their agents selling tickets. Or taxi: A taxi journey from Ciampino to Rome Termini (or anywhere within Rome walls) is a very reasonable (approx) €30 for up to 4 passengers. The taxi rank is outside the terminal. From Rome Termini Station: take the train to Spoleto. It is a direct train, either on the Rome to Ancona line (€9) or the Perugia line (Eurostar: €22). Please note: make sure you get off at Spoleto and not Baiano di Spoleto which is the stop just before on the Ancona line. From Spoleto Station: take the bus to Norcia from outside the train station. The journey takes approx 1 hr and costs €4.40. You can buy your ticket in the station bar. The buses are run by La Società Spoletina, Please see the website http://www.umbriamobilita.it/it (Linea 401) for up-to-date timetables. Alternatively a taxi from Spoleto to Norcia costs about €100. From Fiumicino Airport: make your way to the main train station in the airport and take the FM1 metropolitan train to Rome Tiburtina (the first stop after Termini): There is a very frequent service throughout the day. At night there is a bus service. The journey takes 40 mins and costs €5. Buses to Norcia leave from Rome Tiburtina. From Ciampino Airport: Once you have reached Termini station (see above), take metro line B to Tiburtina. From Tiburtina station: (which is also on metro line B): Make your way to the bus station which is outside. From the ticket counters in the station head right towards McDonalds and take the exit straight ahead. Come out of the station and cross two roads under a fly-over and come to the square, which is the main bus station. La Societa Spoletina operates the buses to Norcia. You can buy a ticket for the bus from the central ticket office within the bus station. A ticket from Tiburtina to Norcia costs approximately €8.50; journey time 3.5 hrs. Please see http://www.umbriamobilita.it/it (Linea E433) for timetables. Please note these buses only depart twice daily.You may find that you have to change onto a local bus just outside Norcia. The main bus will wait until the local bus arrives. From here it is only another 10 mins to Norcia. Ask the local bus driver to drop you off at Porta Romana in Norcia. Please check all times locally. Take a bus or taxi to the centre (12km). There are regular trains from Perugia train station to Spoleto, journey time 1 hour (€5-8). From Spoleto there is a very limited bus service to Norcia, or you could take a taxi (approx. €80). The website http://www.umbriamobilita.it/it lists bus timetables. From the Porta Romana walk under the arch and follow the Corso Sertorio (main street) straight on. Take the fourth street on the right, Via Marconi and then turn immediately left into Via Alfieri. The Grotta Azzurra is on your right hand side and the Palazzo Seneca is on your left hand side. There are parking facilities at first and last hotels. From Rome: We can book you a taxi from either of the Rome airports to the first hotel. The taxi holds 3-4 passengers (depending on luggage) and costs approx €250. Price may alter at weekends, Bank Holidays or late at night. From Perugia: We can book you a taxi from Perugia airport to the first hotel, which costs from €140. The price may alter at weekends, Bank Holidays or late at night. From Spoleto: We can book you a taxi from Spoleto train station to the first hotel, which costs approximately €100. Please place your booking with the ATG office at least two weeks before departure. The cost of the taxi will be confirmed to you once the booking is secured. Payment of the taxi fare should be made locally, not to ATG. The driver will have your flight details and will be waiting in Arrivals with a sign showing your name or ATG. • If you change your flight please notify us so we can contact the taxi company to reschedule the taxi for you. • If, on the day of departure, your flight is cancelled or you miss or change it, please immediately contact the ATG emergency number (number is provided in trip documentation) so we can contact the taxi company to reschedule or cancel the taxi for you. • If your flight is delayed and you have arranged for the taxi to meet you at the destination airport, your taxi driver will wait for you. line to notify us at the earliest possible moment, so we can contact the taxi company to re-schedule or cancel the taxi for you. • Please note that failure to advise ATG that you cannot meet the taxi booked for you, may result in the taxi costs being passed back to you. Important: Taxi prices quoted apply to the local firm used regularly by ATG – and are guaranteed only if you book through the office in advance. If you get a taxi off a taxi rank please ask the driver to confirm the price for the journey before departing. Norcia: Both hotels have parking facilities. Spoleto: Hotel Aurora can offer a secure parking space at about 150m from the hotel for €3 a day. Please ask the hotel reception for a pass. Palazzo Dragoni does not have a private car park. For clients staying there, the hotel can arrange a parking permit valid for the entire length of their stay. With that clients can park just outside the hotel. Neolithic times, provided grazing for herds of sheep, pigs, goats and cattle. In the streams and rivers are fish, notably an abundance of trout. Norcia is traditionally famous for producing some of the tastiest salamis in Italy. On the wide plains of the Piano Grande the superlative red Castellucio lentils are grown, and used widely in local cooking. However, Umbria’s most prized and treasured speciality is the truffle, used sparingly in sauces and oils for its strong flavour. Most of the hotels we use offer a buffet-style breakfast with a wide range of both hot and cold choices. 4- and 5-star hotels almost always offer ‘cooked’ breakfast. Occasionally, in more remote areas, or in some 2 or 3-star hotels, breakfast can be a decidedly more ‘Continental’ affair – i.e. bread, croissant, juice, coffee. The ATG Route Booklets and our ‘Sustainable Shopping Guides’ are filled with information about markets and shops in which to buy your lunch. From seasonal fruits, local cheeses, cured hams and freshly baked breads, you are limited only by what you can carry in your pack! On some routes, usually where there is no other restaurant within walking distance, half-board accommodation is included (see ‘what is included’ for this trip). In other areas where there is a selection of restaurants, ATG includes a list of recommendations in your ATG Route Booklet. Some restaurants are recommended because they have provided meals that have been regularly enjoyed by ATG clients; other restaurants are renowned internationally (e.g., within the Guide Michelin). ...and you are not disappointed by finding the restaurant full. When you book, let us know about any restrictions. Most dietary restrictions do not present a problem on our routes due to the wide variety of shops and restaurants available. Your Route Manager will provide you with advice and recommendations at your briefing. On our walking holidays in Umbria there is no need to dress up for dinner – ‘smart casual’ dress is acceptable in all but the smartest restaurants in Italy. If you decide to treat yourself to a special restaurant, men may wish to wear a jacket and women a dress or skirt. We recommend you bring a comfortable, practical pair of shoes, as there may well be a short distance to walk to dinner. the trip page. For lunches, costs will depend on whether you choose to buy picnic items or eat in bars/restaurants. Dinners: some are included (see ‘what’s included’). For evening meals not included, the route book provides restaurant recommendations to suit a wide range of budgets. Entrance fees to museums, churches, galleries and other sightseeing costs will vary considerably depending on how much you want to see and how old you are (!). Over 60s enjoy significantly reduced prices at many attractions, so it is worth carrying (safely) some form of identification showing your age. Other costs are items of a personal nature, shopping expenditure and transport if you choose to limit your walking with public transport or taxis. the tax has been introduced by many other town councils. The tax is charged by guest per night, with an upper limit to the number of nights that can be charged. The rate (usually €1-2 Euros per person per night) is determined by the rating of the accommodation. This tax is not included in the price of independent holidays but where applicable will be payable direct to your hotel in cash. Support of an ATG Route Manager who will meet you at the start of your holiday for a briefing, move your luggage along the route, book restaurants for you, help you with any travel arrangements and be contactable at any time during your holiday. Lunches: the route books provide information as to where you can purchase picnic supplies and/or bars and restaurants on the route. Evening meals: for evenings when a meal at your hotel is not included, the route book has restaurant suggestions to suit a variety of budgets, and the Route Manager will be pleased to book restaurants on your behalf. Transport to/from the start/end of the route. Entrance fees to �museums, churches etc. The recommended airports for this holiday are Rome (Fiumicino and Ciampino) and Perugia. 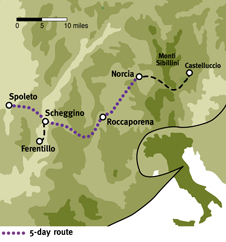 From Rome there are buses to Norcia (3.5 hours) or trains to Spoleto (1.5–2 hours, €9) then bus to Norcia (1 hour). From Perugia there are regular trains to Spoleto (1 hour, €5-€8), then bus to Norcia (1 hour). Taxi to first hotel: from Rome airports €250; from Perugia airport €140; from Spoleto €100. Prices may be significantly higher on Sunday sand public holidays. Taxis can be booked via the ATG office. For more detailed information on reaching the route, see Frequently Asked Questions.